When a stock skyrockets 160% in a mere two months, people notice. People notice even more when they realize Bill Gates and Google Ventures are invested in this hotshot company. The stock is biotech company Editas. It's based in Boston (Cambridge, to be exact) and aims to revolutionize medicine by correcting sick people's DNA. There's just one catch: The company has never tested this gene editing technique on humans. It's worked on mice and pigs in a lab, but that's fairly far away from coming to a hospital near you. 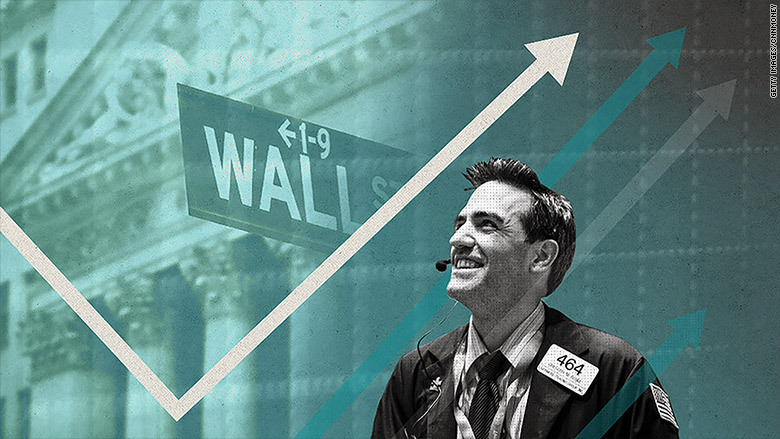 The stock is skyrocketing on the hope of what's to come, even though it could be years away. "It's the first public company in an area that has tremendous promise and could be a real game-changer," says Michael King, an analyst who follows dozens of biotech stocks at JMP Securities. "It boggles the mind." The gene editing technique is known as CRISPR. Last year, Science magazine dubbed it the "breakthrough of the year." Scientists literally go in and cut out the defective genes and replace them with healthy ones. If successful, it could change the way doctors treat conditions such as cystic fibrosis, muscular dystrophy and sickle cell disease. About 6,000 diseases are caused by genetic mutations, according to research firm Cowen and Company. The technique could probably be used to select characteristics in an unborn child like hair or eye color as well, but Editas is very clear that it is working on curing diseases, not made-to-order babies. Editas doesn't exclusively own the CRISPR process. It's used all over the world and there's currently a huge patent war over who discovered it first. In short, there are lots of legal battles and regulatory hurdles ahead for Editas. Still, investors see dollar signs. They foresee the company being able to patent various off-shoots of CRISPR to treat specific diseases. Founded in 2013, Editas initially raised money from prominent health care venture capital firms. Then investors like Gates and Google Ventures came on board. 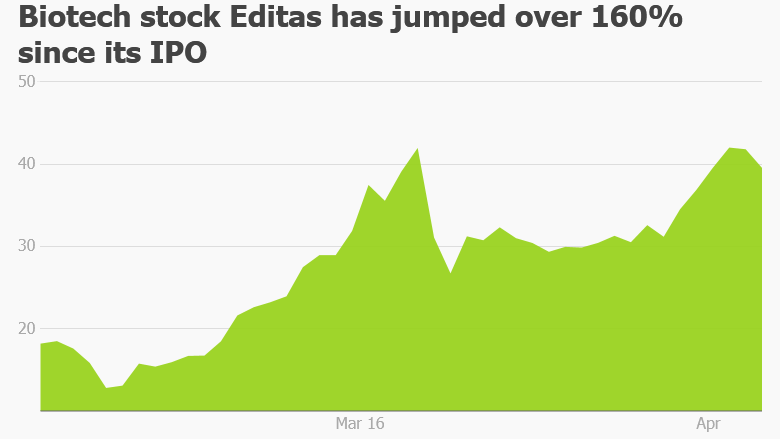 To raise even more capital, Editas did an IPO in early February. The stock now trades on the Nasdaq under the ticker "EDIT." The IPO price was $16, but the stock rose rapidly. By March 8 -- less than a month later -- it closed at over $40 a share, an astonishing 150% gain. This week it closed at an all-time high of just over $42 a share. Editas says it plans to start human trials as early as 2017, but that's contingent on getting the OK from regulators. Initially, the company plans to focus on a cure for a genetic mutation that causes blindness. The company is rolling in cash now and has been on a hiring spree. "They have a great team," says King of JMP Securities. He put a target price of $40 on the stock at the end of March. But plenty of other labs are working on this too. They just haven't sold stocks to the public yet. "With any product years away from commercialization, finding a fair value for EDIT today is difficult," concludes Phil Nadeau, a research analyst at Cowen and Company.